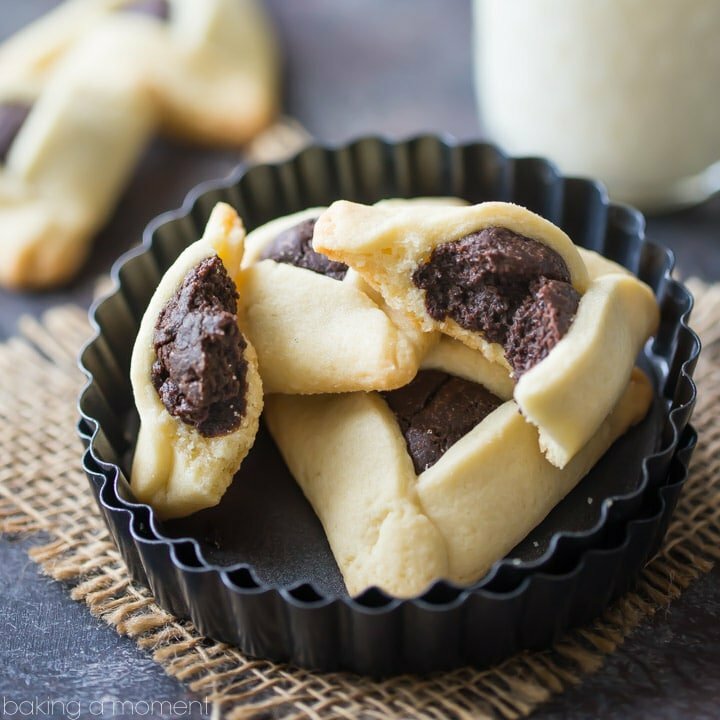 Fudge Brownie Hamantaschen: butter-y sugar cookie encasing a soft, fudge-y brownie filling that’s full of deep chocolate flavor! I have been wanting to try making hamantaschen for so long! They’re traditional for the Jewish holiday Purim, which we don’t really celebrate, but I just love any kind of butter-y, filled cookie. I’m so glad I finally got around to trying these- they’re so much fun to make and so tasty too! Especially when they’re filled with a delicious fudge brownie filling. 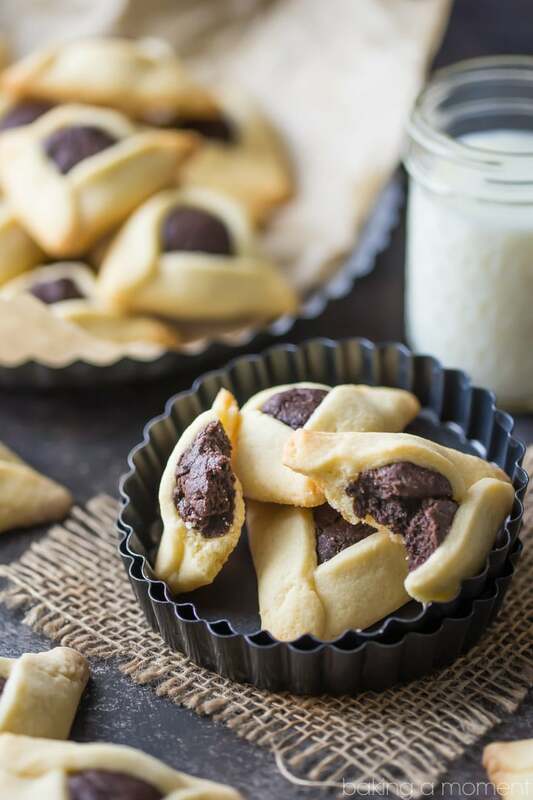 Typically, hamantaschen are a simple and plain cookie dough, rolled and cut into circles, then filled with either prune, apricot, or poppy seed filling. They are meant to look like the three-cornered hat that Haman wore. Haman was a pretty bad dude, so I’m not really sure why they’d want to commemorate him like that, but tradition is tradition I suppose. Anyhow, prunes, apricots, and poppy seeds are ok, but personally I’d prefer a fudge-y chocolate brownie any day of the week! The contrast of butter-y, tender-crisp sugar cookie to soft, rich brownie filling is so outta this world. These fudge brownie hamantaschen are truly the best of both cookie and brownie worlds. Great for Purim of course, but really, I would make these for any occasion! You just can’t go wrong with this flavor combination. 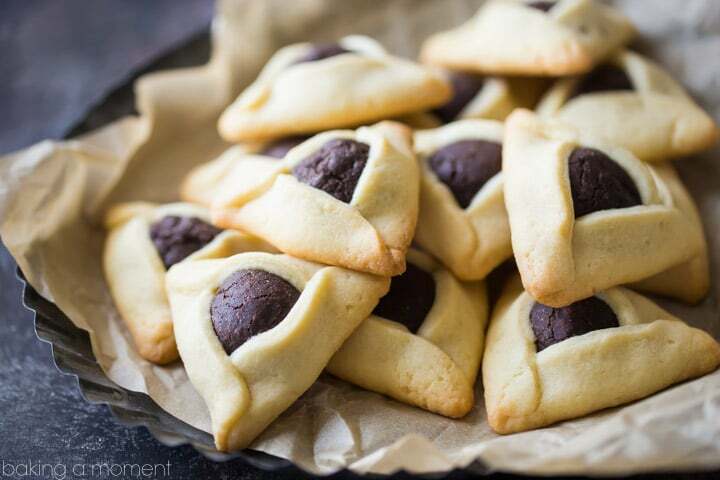 I’m really not much of an expert on Jewish holidays or cuisine, so if you’re really interested to know more, click here for more info on hamantaschen and Purim. For tips on how to fold your hamantaschen, check out this excellent post by Tori Avey. Love all things brownie? 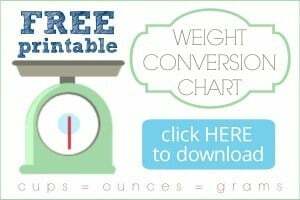 Be sure to follow my “Brownies & Bars” Pinterest board! Stir in the egg vigorously. Preheat the oven to 350 degrees, and line baking sheets with parchment. Mix in the egg until incorporated. Add the cornstarch and salt, and mix on medium-low speed. Stir in the flour, 1/2 cup at a time. Stop adding flour when the dough gathers itself into a ball and pulls away cleanly from the sides of the bowl. Use a 3-inch diameter cookie cutter to cut circles. Place a scant tablespoonful of fudge brownie filling in the center of each circle, and fold 3 sides of the circle inward to create a triangle. Pinch the corners to seal them, and bake for 20 to 25 minutes, or until just beginning to turn golden around the edges. *Rolling pin rings will help you get an even thickness. Oh my god. These look perfect!!! I love hamantaschen. I used to live in philadelphia and there was a place that made them as big as your head…they weren’t just big but also delicious. These might not be as big as my head but I bet the flavor is even better than the ones I used to buy! Oh my gosh, really? I live in Philly! What’s the name of the place? When given the choice….always go with chocolate filling lol! Right? Chocolate anything for that matter! Thanks Kayle! I’ve never made hamantaschen either but I’m on board with anything buttery. And with a fudge filling? I’m pretty sure I’d eat the entire batch by myself. Yum! 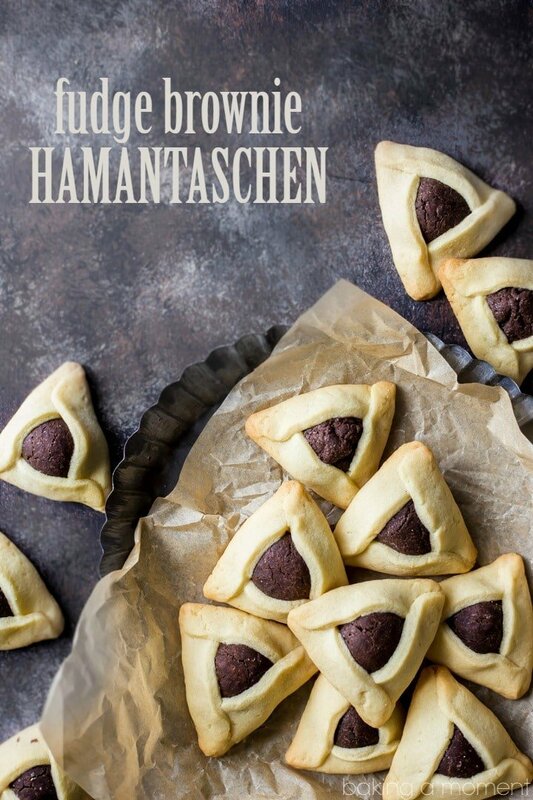 You just took hamantaschen to a whole new level! I’ve never made hamantaschen. These look so tasty! Oh wow! These look so good!